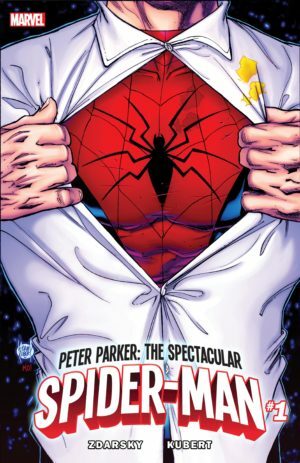 PETER PARKER: THE SPECTACULAR SPIDER-MAN – The New Ongoing Series Debuting This June! Zdarsky & Kubert Bring Peter Parker Back to NYC! New York, NY—February 14th, 2017 — This summer, the one-and-only Spider-Man returns to his friendly neighborhood! Today, Marvel is pleased to announce PETER PARKER: THE SPECTACULAR SPIDER-MAN, the new ongoing series from superstar writer Chip Zdarsky (Star-Lord, Howard the Duck) and legendary artist Adam Kubert (Avengers, X-Men)! A companion to the best-selling Amazing Spider-Man series, these two blockbuster creators are taking Peter Parker back-to-basics in a new series bursting at the seams with heart, humor and over-the-top action! He’s a webslinging, wallcrawling wonder. He’s the world’s greatest super hero. He’s the unluckiest guy on the planet. He’s Spider-Man! Following his globetrotting adventures, it’s big heroics in the Big Apple as Peter Parker returns to the city that never sleeps! Be there as he swings between giant skyscrapers, squares off against his iconic rogues gallery and still manages to be late for that date he had planned! Fans can swing into action this June when Zdarsky and Kubert bring you PETER PARKER: THE SPECTACULAR SPIDER-MAN #1 – available wherever comics are sold. Can’t wait that long? Don’t’ miss your first taste of this highly anticipated series on Free Comic Book Day (May 6th) with a special 10-page story from Chip Zdarsky and Paulo Siqueira!